This is an unpaid review of the Yard House restaurant in downtown San Diego, California. Dadtography.com was not compensated in any way for this review. The opinions in this review are 100% that of the author and are 100% authentic. 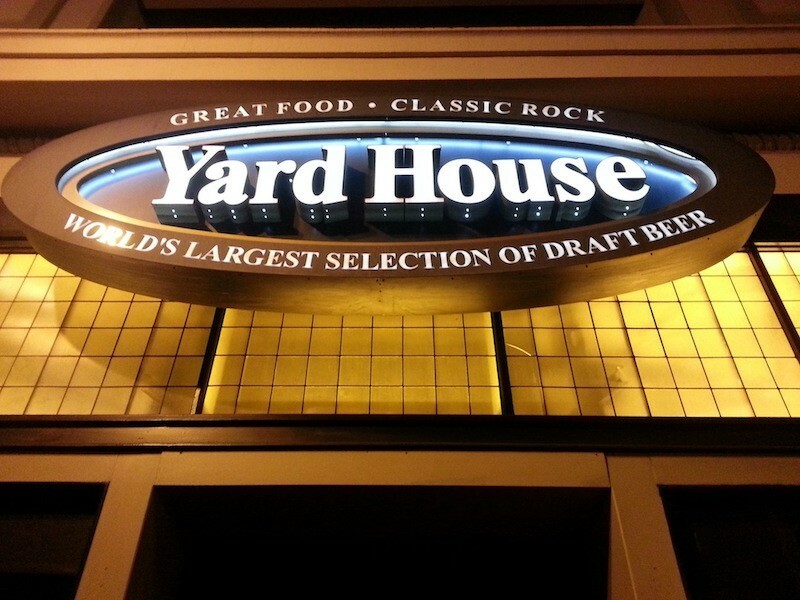 The Yard House San Diego Gaslamp Quarter is permanently closed. With so many dining options in downtown San Diego, how do you know where to go? I was traveling for business, staying at a downtown hotel and decided to explore in the Gaslamp Quarter. I found my way to the Yard House on 4th Avenue. I definitely didn't regret this last-minute business travel decision. The Yard House is a chain of late-night restaurants found sixteen (16) states with forty-four (44) open locations and another six (6) new locations slated to open in 2013. The Yard House that I visited was the one located right in the heart of downtown San Diego, California, in what's known as the Gaslamp Quarter, which is within walking distance from all hotels in that district as well as most of downtown. The Yard House is on 4th Avenue, which has a good amount of traffic but it's slightly outside of the heart of the Gaslamp, so it can be easy to overlook. How's the food at Yard House? They were well-prepared, not too salty and delivered hot. The Ahi Poke bowl was a nice change over the typical deep fried bar food, but raw fish isn't for everyone. Shrimp Ceviche is another relatively healthy option and great for those shell fish lovers. As for entrees, the Yard House offers a wide variety of choices. They're known for their burgers (my server recommended the turkey burger, actually), but all of them sounded great. They have appetizer and entree salads, sandwiches, their own lineup of pizzas, street tacos and more. If you've got picky eaters or a large group, the Yard House would be a great choice because everyone is sure to find something they like here. To view the for Yard House menu, click here. The truffle fries were excellent, possibly due in large part because I love truffle anything. How is the atmosphere at Yard House? The Yard House on 4th Avenue was very large, with 4 main seating sections and a large bar area. The booth we sat in could easily have accommodated 8 people even though there were just two in my party. We arrived close to 10 pm after a San Diego Padres baseball game and we were able to get right in without a wait. The restaurant is so large, though, that intimate conversations were never a problem and I could hardly even tell there was anyone else in the place (this despite it being nearly full). Aside from the lack of light, the atmosphere didn't leave much of an impression. It's about what you'd expect in a higher-end sports bar atmosphere. The restaurant was very dim - almost too dim. I wouldn't call it fine dining, but it was lit as if it were. How is the service at Yard House? Our server indicated he had been working in that particular store for only a few months but he was clearly not new to the restaurant industry. He didn't quite have the menu down just yet, but he knew how to stall when we'd ask him questions. If he just didn't know, he'd go ask and come back to us with an answer. Our drinks were refilled promptly and the food always came out hot (or cold, as needed). Great service can be hit or miss anywhere, though. It all depends on the server and section you get. Overall, I had a very good experience at the Yard House in San Diego. The food was great, the menu was tough to beat and while the atmosphere wasn't anything memorable I'd definitely be willing to try another Yard House location or this same one if I find my way back to southern California in the future. I have a feeling this Yard House location will have a tough time surviving, though. There's just so much competition with other restaurants in the Gaslamp Quarter of San Diego. I guess we'll see if it's able to survive! What's your favorite restaurant in the San Diego Gaslamp Quarter? Leave a comment below!